Interview with Dr. Patrick Faricy conducted December 2009. Please allow the diversion of a personalized post. 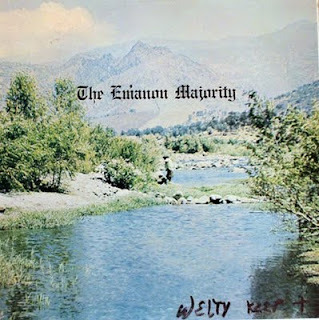 A few months ago I found a record by a folk band from The Springs – Emanon Majority. The LP features the three-part harmony of Pat Faricy, John Griebel and Mel Perry. "It was recorded in 1965 while we were seniors at St. Mary's High School in Colorado Springs," said Patrick Faricy. "We originally were the New Brandywine Singers, but when the real Brandywine Singers found out about us and threatened to sue, we changed the name to Emanon [No Name--spelled backwards]." Faricy grew up in Pueblo, attending Saint Patrick's grade school. When he was 10 years old, he and his family moved to Colorado Springs. "This was our only album and we sold it ourselves; I believe we made 500 copies. We all are still friends but went our separate ways after leaving high school. Mel and I are physicians in Colorado Springs, John is an attorney in Denver." A recent trip home to Pueblo for Thanksgiving had me feeling pretty melancholy after I crossed the Colorado state line—back to my current zip code. No matter how many times I come home to visit, the trip is much too short. 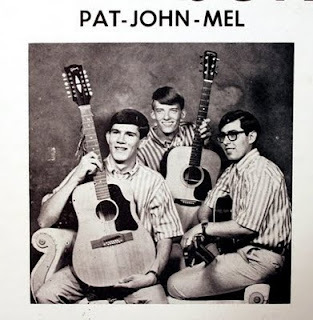 As we continued the long drive I couldn’t help but think about a song I had heard on this album (the group's take on a Kingston Trio song, "I'm Going Home"). I’d like to share it with you. No matter where you wander, have a wonderful holiday. Interview with Jim and John Cooper conducted September 2009. NOTE: In 2016, I authored a story on Jim and John Cooper in The PULP, with additional information. 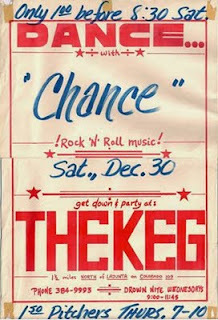 Call it destiny, or fate, but for the band Chance, their first public appearance was just that—sheer luck. That night, after they performed their one song (a cover of REO Speedwagon’s “Riding the Storm Out”), they were officially a performing band. 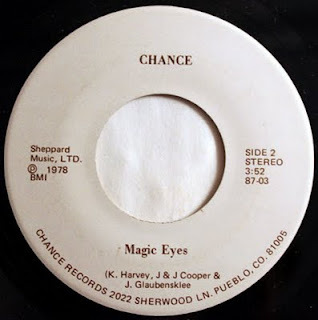 Chance started out as four friends from Pueblo South High School - twin brothers Jim and John Cooper on guitar and vocals, Jeff Glaubensklee on drums, and Karl Harvey on bass and vocals. While they had toyed around with forming a band, that accidental, spur of the moment gig, that fateful night in 1975, gave them the confidence to go forward. Before too long they were being booked around town. While the band was enjoying local success, it was not their ultimate goal. The foursome set their sights on California, where they thought their music would catch the ear of national record companies. To better their chances, they decided to produce a record. 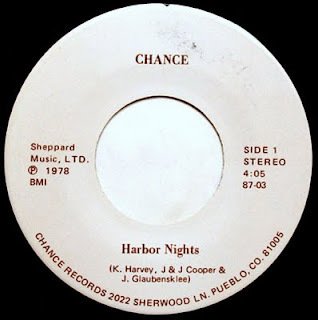 “Karl came up with the idea for “Harbor Nights.” It was loosely based upon a trip the band took to Hawaii in 1977 and an experience on one of the islands. “Harbor Nights” was one of the first songs we wrote as a band, experimenting with musical arrangements and harmony structures,” said John Cooper. “Jim burned some midnight oil and came up with the beginnings of “Magic Eyes” – a song about a fantasy girl. We wanted the guitars to have a magical, mystical, hypnotic feel, the drums and bass to be solid, and the vocals to be up front with harmony,” John Cooper said. 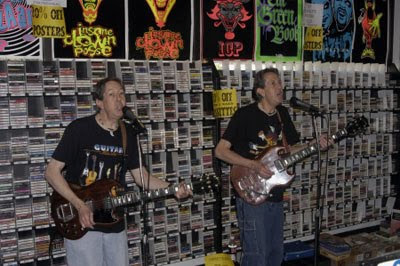 The band recorded the songs at American Recording Studio in Denver, printed up 1,000 copies, and set out to distribute them around town and to local disc jockeys. While the band was fairly successful at home, the realities of trying to break out nationally quickly became apparent, when they decided to take the next step – mail the single to major record labels. “Our mailman soon turned on us and began delivering form letters of rejection from the labels. Paul McCartney’s publishing company was actually very cordial in their response – they said Paul was too busy touring with Wings to take on any new projects, and wished us the best of luck,” Jim Cooper said. Not content with rejection, in 1978 the band took the bold step of packing up and moving to Los Angeles, in an effort to get the single directly into the hands of the record companies. John Cooper, and Jeff Glaubensklee (drums). 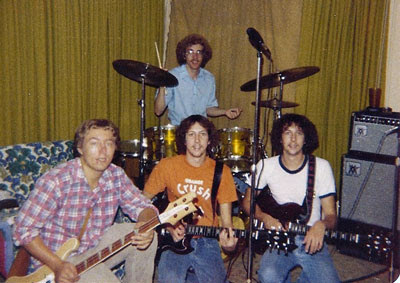 While back in Pueblo the band opened for Robert John’s 1979 Colorado State Fair show. John had just scored a Top 10 hit with “Sad Eyes.” The experience gave them the confidence to make several trips back to Los Angeles, taking up a long-term residence there, in 1982. While the newly-named group gained valuable experience, producing demos, making connections and playing gigs in Los Angeles, in 1989 they decided to disband the group, and come home to Pueblo. Jim and his brother John continue to write and record in Pueblo, calling themselves the CooperSonics.. The group’s latest release is entitled Sonic Harmonics.